Did you know that your brain cannot make a difference between real and imagined? With Time Line Therapy®you are using your imagination with volition. After discovering how you store time on the unconscious level, using 11 easy to follow steps you will let go of all past negative emotions one by one. This course will provide you with a completion certificate. 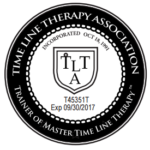 After your course, you will be handed an application to The Time Line Therapy® Association. Becoming a board member will ensure your certification and seal of excellence. My company is a registered school of Time Line Therapy®. After finishing your course you will send in your completion certificate for review. As soon as your completion certificate is validated, you will receive your certification from the Association. You will receive your seal of excellence which you can place on your business marketing materials. NLP is the most practical, result-oriented technology of detecting, understanding and getting control of our conscious and unconscious thinking. I will teach you how to use NLP with yourself and with others. 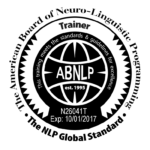 I am a designated trainer of NLP practitioners and NLP master practitioners. Since all NLP trainers have their special approach, mine is keeping NLP simple and to the point with well-defined steps to specific outcomes. I focus on teaching the importance of self-knowledge and self-consciousness. You will find my next training here. Hypnosis is one of my favorites among the modalities I use and teach. I enjoy the light to medium trance that I create during my sessions to help my clients’ relaxation and comfort in learning new things about themselves. It is easy to learn and gives tremendous insight how fast the unconscious mind is learning. In my hypnosis course, you will learn Ericksonian indirect permissive hypnosis. You will increase your results with your clients and customers. Ericksonian hypnosis is the most effective way to gain conscious and unconscious congruency. This course will provide you with a completion certificate. 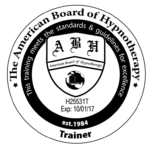 After your course, you will be handed an application to the American Board of Hypnotherapy (ABH). Becoming a board member will ensure your certification by the boards. My company is a registered school of Hypnosis. After finishing your course, you will send in your completion certificate for review. As soon as your completion certificate is validated, you will receive your certification from the ABH. You will receive your seal of excellence which you can place on your business marketing materials. Neuro Linguistic Programming is a model of communication and how that communication creates and affects our behavior. It is a synthesis of cognitive and behavioral philosophies which focus on the information coming in through the neurology and the programs we run inside our heads to produce the behaviors we do. As a master coach of NLP, I utilize quantum linguistics, values elicitation, slight of mouth patterns just to mention a few. I utilize my master coach training in all my sessions. I am a designated trainer of NLP practitioners and NLP master practitioners. 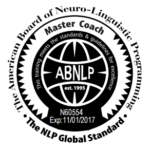 Since all NLP trainers have their special approach, mine is keeping NLP simple and to the point with well-defined steps to outcomes. I focus on teaching the importance of self-knowledge and self-consciousness. You will find my next training here. For references you can call the American Board of NLP, The Time Line Thearapy® Association and The American Board of Hypnotherapy.